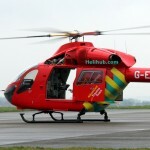 London’s Air Ambulance has reached a significant milestone in treating 30,000 trauma patients since it began in 1989. Thanks to the generous support of the London community, our charity has been able to save the lives of many people with time-critical medical interventions delivered at the scene of the incident. With only one advanced trauma doctor and paramedic on call for the 10 million who live, work and travel within the capital, our charity is currently raising money for a second helicopter and extended flying hours. Most common missions include road traffic collisions– involving pedestrians, cyclists and motorcyclists – which accounts for 1 in 3 of our patients and with 1 in 4 missions involving patients who have been stabbed or shot. Without the critical intervention carried out by the team, fatality rates relating to these incidents in the capital would be even higher. Graham Hodgkin CEO of London’s Air Ambulance, added: “The success of the service depends on many people and I would like to take this opportunity to thank the London Community for their generous support.